Every American Road® warrior needs a cap. This six-panel, relaxed fit cap with adjustable self-fabric back and brass-colored buckle-snap fastener and grommet is perfect to wear everyday or wear for those special cruises and car rallies. The American Road® T-shirt is 100% pre-shrunk cotton. Add the name of your favorite roadie to the back of this shirt for an additional $5.00! 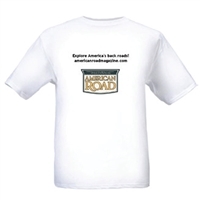 The American Road® T-shirt is 100% pre-shrunk cotton. Add the name of your favorite roadie to the back of this shirt for an additional $5.00! The American Road® polo is a 50/50 cotton blend to minimize shrinkage. The American Road® polo is a 50/50 cotton blend to minimize shrinkage. American Road®'s hand-embroidered long sleeve denim shirt is a must for every American Road enthusiast. You'll look great in this stylish shirt made of 100% cotton pre-washed for comfort and softness. Makes a great jacket over a t-shirt or tank! American Road®'s hand-embroidered long sleeve denim shirt is a must for every American Road enthusiast. You'll look great in this stylish shirt made of 100% cotton pre-washed for comfort and softness. Makes a great jacket over a t-shirt or tank!